Hearing loss can occur naturally as part of the aging process. We all have senior citizen relatives and acquaintances that have some amount of hearing loss. Hearing loss in general is extremely common as we age: Roughly 1 in 3 adults between the ages of 65 and 74 has such loss, and nearly half of people over 75 have trouble hearing. Certain medical conditions and medications may play a role, as well as the natural progression of the aging process. But, there is another form of hearing loss known as “noise-induced hearing loss” that is totally avoidable. This type of loss can occur in one or both ears and is caused by exposure to loud sounds. There are many ways this can happen. According to the Centers for Disease Control (CDC), even just one large noise such as an explosion can result in long-term impairment. It also can be caused by listening to loud, though less sudden, noises over an extended period of time. In both cases, excessively loud noise causes trauma to the inner ear, which can be permanent. This can also cause a painful condition called tinnitus. This is a ringing, roaring, hissing or buzzing in one or both ears. Sound is measured in units called decibels (dB): Those that register under 75 dB are unlikely to impair your hearing ability. However, anything above 85 dB can cause damage if exposure is prolonged or constantly repeated. Moreover, the louder the sound, the less time it takes for that damage to occur. The National Institute on Deafness strongly recommends wearing earplugs in noisy settings such as concerts and if you work or reside near a construction site. If you do have trouble hearing, don’t avoid getting your hearing checked. Unfortunately, many people wait years after noticing a problem before they seek help. 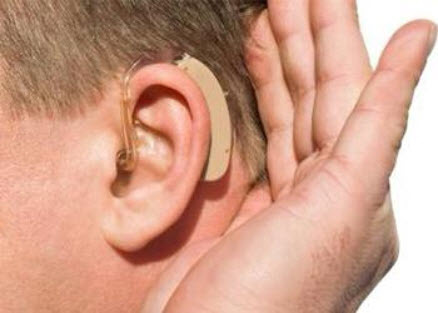 Currently, the only method of rehabilitation is amplification via hearing aids, cochlear implants, or other types of listening devices. Wax buildup may be another cause for loss and this can be easily treated.